Slitlamp Imaging is the photography of the structures of the eye with a specially designed horizontally mounted microscope. 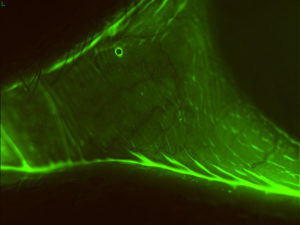 The primary illumination for the microscope is produced by a light which can be adjusted from a very broad pattern to a very narrow slit of light. It is from this slit of light that the Slitlamp derives its name. The slit can be used to isolate structures in the eye. The photographs below illustrate the use of a slitlamp. Keratoconus is a degenerative disorder of the eye in which structural changes within the cornea cause it to thin and change to a more conical shape than the more normal gradual curve. 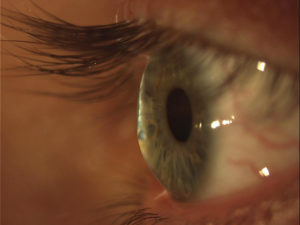 Keratoconus can cause substantial distortion of vision, with multiple images, streaking and sensitivity to light all often reported by the person. It is typically diagnosed in the person's adolescent years. If both eyes are significantly affected, the deterioration in vision can affect the person's ability to drive a car or read normal print. In most cases, corrective lenses fitted by a specialist are effective enough to allow the person to continue to drive legally and likewise function normally. Further progression of the disease may require surgery, for which several options are available. 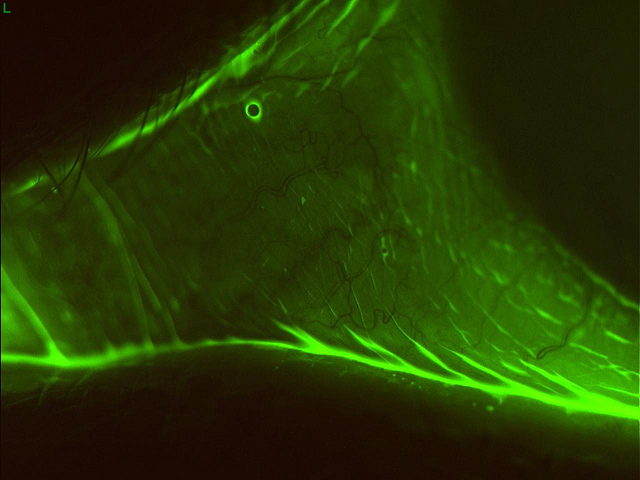 This is a test that uses orange dye (fluorescein) and a blue light to detect foreign bodies in the eye. This test can also detect damage to the cornea.